Although Olive Films’ releases tend to be pricey especially since they tend not to contain any features, they do often put out, relatively speaking, obscure titles. So for those Humphrey Bogart fans out there, or fans of film noir in general, this is a good pick-up even in the $20-25 range. Will the audio or video transfers wow you? Hardly. 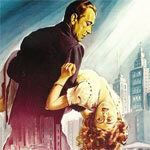 Yet the movie itself is nicely done and Bogart gives his typical (i.e. solid) performance.